There is no better way to kick off this nostalgia-tinged column with an album filled front to back with it. When I heard Weezer’s self titled debut back in early high school, I was immediately struck by how different it was than what I had been currently listening to at the time. I had not yet been extensively exposed to classic rock or punk, so nearly everything about the so-called Blue Album was clean and fresh. Rock and roll generally seemed to be very drudgy in the early post-grunge error, and the Blue Album was a seemingly new and exciting combination of energy and pop-power riffs. The first four tracks, Surf Wax America, and In The Garage were immediate favorites. Specifically, In The Garage, with references to semi-obscure X-men and Dungeons & Dragons, seemed to reflect the geek culture that I was right in the middle of. 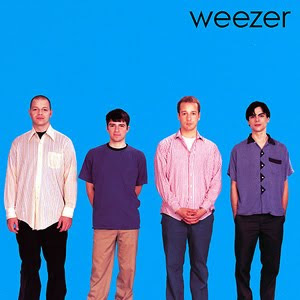 I and my friends actually listened to The Blue Album while at Chess Club. What made, and makes, In The Garage especially powerful is that I was not actually into D&D, or Kiss, yet the song was still resonant to 14-year old ears. A sticking point for me has always been The Sweater Song, a song to this day I still have never fully “got.” I would argue vehemently, “This is worst song on the album!” to many an ear at the lunch tables. The use of Musique concrete (e.g., “Life’s so rad! Do you want a beer?”) always struck me as just plain weird. This was the first time I can recall ever hearing anything like it, though it showed up before in the work of Pink Floyd, and would also appears in some of the early stuff by the Mars Volta. After picking it up for the first time in about five years, a few things struck me pretty quickly. The first four songs are still killer; very straightforward and direct, accessible, very musically catchy and poppy. Although musically dissimilar, the structure of the songs reminded me of the way that The Strokes would end up presenting their albums six years down the road. The main theme that emerged when I revisited the Blue Album was the blank, non-specific, yet emotional resonance that fills the songs. The linear notes seem to echo this phenomenon. With no words, and a just a picture of a band set-up, it invites the question, “What do you want this album to be about?” The music and lyrics are about something, distant yet familiar, and it is up to the listener to project what they want on to them. Actually, now that I think about it, I do remember going to that party, and it was pretty rad.